A range of Air Quality Transducers / Transmitters, Carbon Monoxide (CO) Sensors and Carbon Dioxide (CO2) Sensors for monitoring internal Air Quality and levels of Gases. The available sensors include Room and Duct type mounts, with some multi-purpose sensors that can also monitor Temperature and even Humidity. Air Flow Sensors are also available. CO2 Sensor / Transmitter with scaled DC Voltage or 4-20mA output and a range of 0-2000ppm. CO2 Sensor / Transmitter with scaled DC Voltage or 4-20mA output and a range of 0-2000ppm. Also has Temperature (analogue output) and LED CO2 Level indicators. Carbon Monoxide Sensor (0-300ppm) with scaled DC Voltage output. Carbon Monoxide Sensor (0-300ppm) with scaled DC Voltage output plus Relay output, which can be switched at set trip points. CO Sensor / Transmitter with 0-5V, 0-10Vdc or 4-20mA scaled output and a multiple ranges of 0-100, 150, 300, 400 or 500 ppm. LCD Display. 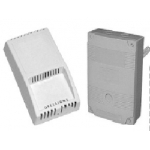 Options include Relay outputs, Modbus or BACNet interface. Wall-mounted. CO Sensor / Transmitter with 0-10Vdc or 4-20mA scaled output and a range of 0-300ppm. LCD Display and Modbus Output are options. Duct-mounted. Sensitive to a broad range of VOC's, the AIR4100 Air Quality sensor is ideal for optimising the level of fresh air introduced into buildings for ventillation purposes. 0-10V or 0-5V output. Sensitive to a broad range of VOC's, the AIR4200 Air Quality sensor is ideal for optimising the level of fresh air introduced into buildings for ventillation purposes. 0-10V or 0-5V output. PM2.5, CO2, Temperature and Relative Humidity Data Logger. Touch Screen display. RS485 communications. Standalone or use as part of a monitoring solution. Modbus RTU Protocol supported. PM2.5, CO2, Temperature and Relative Humidity Data Logger. Touch Screen display. RS485 communications. Standalone or use as part of a monitoring solution. Modbus RTU/TCP & MQTT Protocols supported. PM2.5, CO + CO2, Temperature and Relative Humidity Data Logger. Touch Screen display. RS485 communications. Standalone or use as part of a monitoring solution. Modbus RTU Protocol supported. PM2.5, CO + CO2, Temperature and Relative Humidity Data Logger. Touch Screen display. RS485 communications. Standalone or use as part of a monitoring solution. Modbus RTU/TCP & MQTT Protocols supported.